With all things: Integrity first! No matter how costly it is to fix a mistake, doing the right thing will always pay off in the long run. My mom and dad always believed that those people behind you on the road to life, were those that needed your help most. In my family helping another person was not just a virtue, it was next to ‘Godliness’ and there were many examples of how it showed up in their actions. Whether it be offering someone a ride to church on Sundays, or inviting someone for a home cooked meal who had been down on their luck… My parents always taught us to give generously and freely, and I still believe it’s the right way to live. And then, I left my corporate job (and paycheck) and launched my own business. And some of those generosity-based values were just that…values. And though values are an important part of running an aligned business, being generous is much easier when you’re making enough money to pay your bills. I’m a business-life-balance coach specializing in moms in business, which basically means… I ‘help’ people. This is what I do for a living, and help is my ‘product’. Instead of selling widgets or commodities, I help my clients figure out how to be more effective with their time, set up repeatable processes to work more efficiently, and how to focus their services and products to be most profitable in the time they wish to devote to work. To win at this game of entrepreneurship, I had to figure out this value-based charging for my own business first. Being of ‘service’ vs. selling products meant I had to shift my own helping paradigm to a profitable helping business model. And, I can tell you, THIS was a long and arduous process which ended up nearly bankrupting my business. Although I strongly believe in the value of unconditional help… I do have an obligation to keep the doors of my business open and the lights on. So, I had to grow from the inside to realize the ‘value’ of the help I provided for others first…and then attach a price that was equal to the value I provide and the money I save others in the long run who invest in my services. Everyone loves a deal, but NO ONE likes to feel as though they’re taking advantage of another person. SO, it’s incumbent upon you to figure out how to charge for yourself, your business and your clients! And you might be surprised… the suggestions I have are less about mathematics and accounting, and much more about the softer under-side of what makes your business work, how it started, what it’s meant to do, and who it’s meant to serve. One of the best ways to value your services and products for what they’re worth is to get into a deep sense of alignment. Coming into alignment means working from the inside out. Uncovering and clearly defining your core values and needs, discovering your passions and the purpose for being in business and then defining the values and needs of your business are good places to begin. When you work from the inside out – you’ll begin lining all the pieces up into your uniquely-defined business-life-balance – or what I refer to is homeostasis. This is an effective way to work toward enhancing the value of your services and overcoming the guilt of charging what you’re worth. One of the most important things to do in business is truly understand who your ideal clients are and how you are best suited to help them. This is why your abundance is uniquely connected to the abundance of the others you help… However, it’s important to keep this in perspective. So today, I say that it’s best to really begin from a place of your passion, identify your core ideal niche and uncover their pain points that your services can be a solution to. Crystallize your marketing message around your ideal clients, and then work to solve their unique problems with your services. My passion is healthy families and smart, savvy, powerful, fully-whole, creative and passionate moms. I believe they’re the key to a healthy world. As a result of these exercises in alignment for my business, I’ve designed services and programs to support them to create an awesome business in the time they have, focus on their sweet spot, and then free their time for a passionate and amazing life that fits. Those who most desire what you have to offer will happily invest in you because they’ll understand that you also have a family to feed, bills to pay, and deadlines to meet. Then, the next time you’re approached to offer your services for free, you’ll be able to respectfully decline with a totally aligned message, and redirect your people to something you’ve created (think resources, pdf’s, downloads or recordings) that is completely free and offers them some answers they seek. Here’s a great alignment training I developed and happily offer people today as a first step instead of accepting a cup of coffee. So what happens when things move forward and you’re asked to speak for free, or offer a free workshop? This is another gross assumption that the world makes about your expertise – that you’re so good, you’ll speak for free with the promise of getting business leads. And, this does sometimes happen as long as a few conditions are met. First, you need to only say yest to those engagements that gather your ideal clients. Speaking to people who are not aligned with your message can actually be bad for your business. I’ve actually had someone come to me after a misaligned speaking audience and say “You were great! I loved your presentation… I’ll NEVER hire you, but thanks for the free presentation!” – talk about a sock in the gut! The hours of phone calls, planning, creating my talking points and presentation, traveling there… yadda yadda – I’m sure you know the drill by now. Totally deflated and derailed… and when I gave it enough time for perspective to show up – I was angry. First at that person, and then at myself. In hindsight though – I realize that this was probably just the message I had to hear to get clear. Are your ideal clients gathered for you already? IF so, how many people will be gathered for you? What would the equivalent exposure to this group actually cost you if you were paying to advertise to them? What type of access will you get to them/they to you? Can you deepen their engagement in any way? Will you be allowed to gather their emails, send them something, sell them something (products/widgets) or make an offer as a part of your presentation? What are the particular terms? When working with non-profits, low budgets are common which transfers into low fees. But you can try to negotiate the best deal you can for both you and your business. If they cannot afford to pay you a fee, perhaps you could secure a complimentary booth at an upcoming sponsored event to promote your business. Or maybe the association can recommend you to their parent organization and provide you with tickets to attend an upcoming conference. It’s important for you to negotiate this because the more exposure people have to you, the higher your perceived expertise will be, and the more likely you are to be remembered. This is why it’s so incredibly important to nail your niche. It will help you cut through all the marketing noise to connect with your ideal clients, and keep in mind, you don’t have the time to help everyone, so only focus on helping people who most desire your services. Sometimes people who struggle with charging what they’re worth experience guilt. One of the most important ways to overcome the feeling of guilt connected with charging for services is to shift your perspective. If you grew up in a ‘Scarcity Mindset’ family system… the feeling that there just is never enough – you may still carry that feeling into your business. I grew up with a scarcity mentality. While my mom taught me amazing lessons – she was born in 1929 after all, and as such lived her formative years through the Great Depression… on a farm, in the midwest, with seven siblings and a widowed mother… it was hard. There really wasn’t much ‘extra’ at all. And, some sadness and pain from those years still linger even 87 years later. And, her experience as a child of course colored many aspects of my childhood, and influenced my thoughts and beliefs around a ‘never enough’ mindset. After all, where do you think mindset patterns are born? That is why it’s important to seek perspective in everything we do. Since I don’t like to judge the past, nor believe in good and bad when looking back… I try to use my past as navigational cues for myself to deepen my own awareness. I’ve learned so much and am so thankful for those lessons and the perspectives I’ve gained because it’s truly helped me to shift, and I believe that’s been one of the cornerstones and turning points in my own business. Shifting from a scarcity to abundance mindset is one of the most powerful steps toward becoming profitable in business. 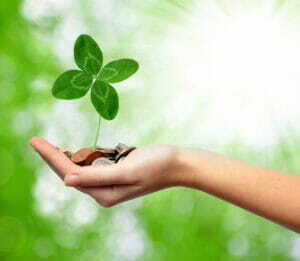 Be willing to stand in abundance helps you realize when there is not a good fit between you and a potential client. If there is not a fit, it’s really important to let those opportunities go to others whose products and services better meet their needs. After all, Abundance is a Universal Law. Abundance depends upon a recognition of the laws of Abundance, and the fact that Mind is not only the creator, but the only creator of all there is. Certainly nothing can be created, before we know that it can be created and then make the proper effort. There is no more electricity in the world today than there was fifty years ago, but until someone recognized the law by which it could be made of service, we received no benefit; now that the law is understood, practically the whole world is lit by it. So with the law of abundance; it is only those who recognize the law and place themselves in harmony with it, who share in its benefits. Mindset is one of the most critical aspects to consider to overcome your hesitation to charge what you’re worth. When you shift your mindset to one of abundance – that the Universe is every expanding and more than abundant in every way. This means it is FULL of opportunity and filled with people who are destined and aligned to work with you. When you begin to operate from a place of abundance, you’ll soon see that letting go of clients that are not great matches with you will open your hands to receive better, more suitable clients who resonate with your message. Part of receiving and feeling more abundant is letting go. And, it’s very important to let those unwilling, or unprepared to pay for your services go to make room for other new opportunities. You’re not doing anything wrong… you’re taking steps in the right direction toward more prosperity when you clarify your ideal client and craft your services and offers around their direct needs. Which of the three areas is the biggest gap for you now in business? What are three steps or actions you can take today to help yourself – so you can better align, help your clients and step into an abundance mindset? If at any time you feel ready to move forward and uncover your own barriers in business – I can help you and make your way much faster and with clarity toward a business that serves others, works for you, and is profitable. To get started, go here and schedule a complimentary Discovery Call. We’ll discuss where you are now, what’s holding you back and see if working together is a good next step on your path. Please share your thoughts in the comments below. Let us know what you struggle with, or share any suggestions you have to help others!